How many of your students love conjugating verbs? Personally, I don't know of any! And do you know what conjugating verbs teaches students to do? It teaches them to go through all of the verb conjugations in their head when they are trying to communicate which actually hinders their ability to speak fluently. But if I don't teach verb conjugations, how do I teach my students to communicate? Well - let's start by thinking about what we talk about on a daily basis? When you see a friend, what do you say? "Hi, how are you? (I'm fine, not so good, tired, hungry, hot, cold, sad, happy). Why are you sad? Why are you tired? I'm tired, sad, hungry because . . .
What did you do this morning, yesterday, this weekend? What did you have for lunch? What are you doing this afternoon? Did you go to the soccer game? Were Pablo and Antonio there? What time is it? Where is . . . When is . . . Is it cold outside? What's the weather going to be tomorrow? Important Point #1. Most of the time, when we're speaking, we use "you" and "I". Start paying attention to your daily conversations and notice how often you are either asking someone a question or talking from the I point of view. Problem: Conjugating verbs hinders students' conversational fluidity. Solution: Instead of conjugating verbs, learn the conjugations based on subject pronouns. Step 1: Teach your students verbs in the "yo" and "tú" forms. Start with regular "yo" forms. ex. hablo, canto, corro, escribo, voy, estoy, soy, tengo, vengo, puedo etc. Step 2: Add irregular "yo" forms. Pick a few verbs to work on at a time and practice with lots of repetition. For more tips, read my blog series, "Teaching Tricky Verbs and Grammar". If your students can speak fluently with I and you, they will be able to communicate effectively early on and will feel successful and want to learn more. In addition, they'll understand much more when someone speaks to them because they will listen for the "o" or "as, es" endings. Step 3: Move on to "tú" and then "él, ella, Ud.". ex. hablas, cantas, corres, escribes, vas, estás, eres, tienes, vienes, puedes, etc. Important Point #2. It is very hard to communicate many of the things we want to say without multiple tenses, especially the past tense. Problem: We often don't teach the past tense until the end of the first year or the second year of a language. This is not how we speak naturally - we use the past tense ALL THE TIME! If you disagree, just try to go an hour without speaking in the past tense. Solution: Start teaching other tenses as soon as they are needed for communication. The key is to give students the bits of knowledge that they need to communicate, without overwhelming them with the whole tense. Ex. Every Monday, in my Spanish classes, we spend 10-20 minutes talking about what we did over the weekend. Students have a section in their notebooks where they write down any new phrases that they learn and they use these pages as a reference during our weekly discussions. This is where I introduce the past tense. "¿Qué hiciste este fin de semana?" Fui al cine. Jugué fútbol. Hablé por teléfono con mi amiga. In Spanish 1, they ask me, "¿Cómo se dice, "I played soccer.?" and I tell them and write it on the board. This is great because they're learning how to say the things that matter most to them. I show students for most verbs, they just change the AR, ER, IR endings to é or í to communicate in the past. In higher levels, or as the students get more advanced, I teach students to ask follow up questions. Ex. ¿Con quién jugaste fútbol? ¿Dónde jugaste fútbol? ¿A qué hora jugaste fútbol? ¿Ganaste? ¿Marcaste un gol? ¿Cómo es tu uniforme? Again, use very simple explanations. Use either -aste or -iste to ask a "you" question about something that happened in the past. And this leads me to my final point . . . Important Point #3. Question words are key!! Problem: Students don't know what the question words mean and stare at you blankly when you ask them a question. Solution: Learn question words one at a time and use a variety of activities to practice on a weekly basis. Pick a question word or phrase and practice it in isolation. Start simply and spiral the learning process, adding more depth to their questions and answers each year. 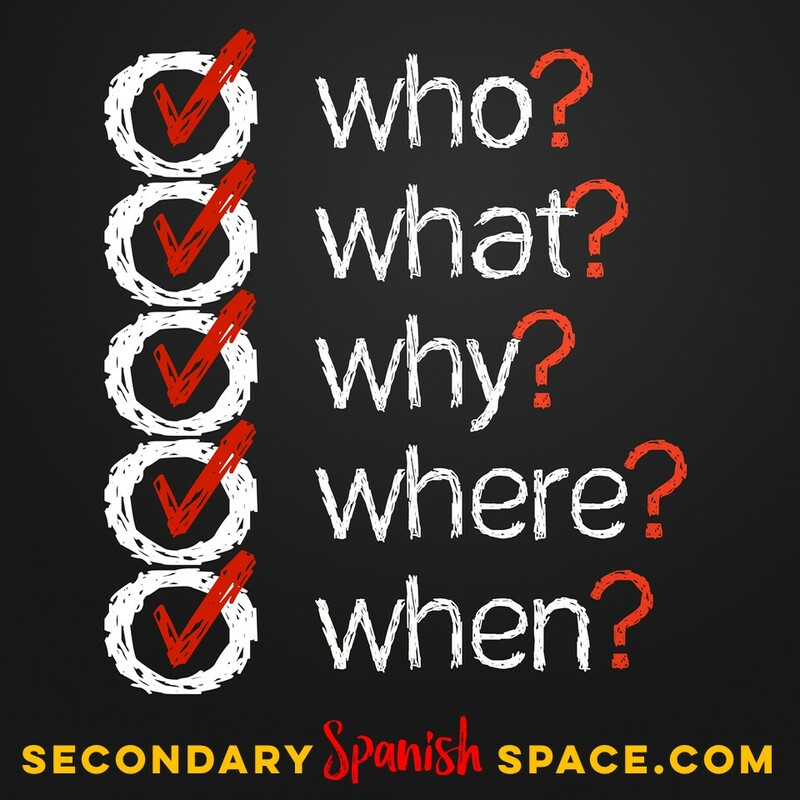 Check out this example with "¿Dónde está?". Level 1 - "¿Dónde está el lápiz?" "Está allí/aquí." Start with classroom objects and have them point to the object as part of their answer. Level 2 - "¿Dónde está tu lápiz?" "Está en mi mochila/encima de mi pupitre/en el suelo." Level 3 - (Hide an object and have students guess where it is using prepositions of location). "¿Dónde está el lápiz?" "Está debajo del libro de Juan." "Está en el cajón del escritorio de Sra. Platt." Level 4 - "¿Dónde está McDonalds y cómo llego allí?" "Está en el centro del pueblo, cerca de Walgreens. Para llegar . . . (student gives directions in Spanish). 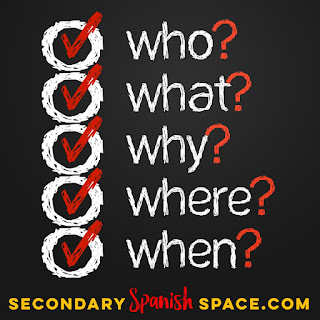 Repeat this process and practice other questions words on a regular basis in real life situations to ensure that your students understand them well. 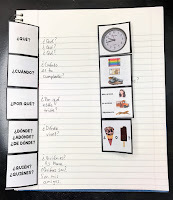 Get a free set of interactive notebook question word flashcards to help your visual learners in my Free Resource Library. 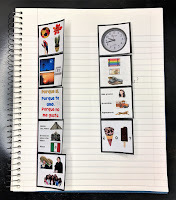 These are great because students tape them directly into their notebooks and can then use them as a reference throughout the whole year. 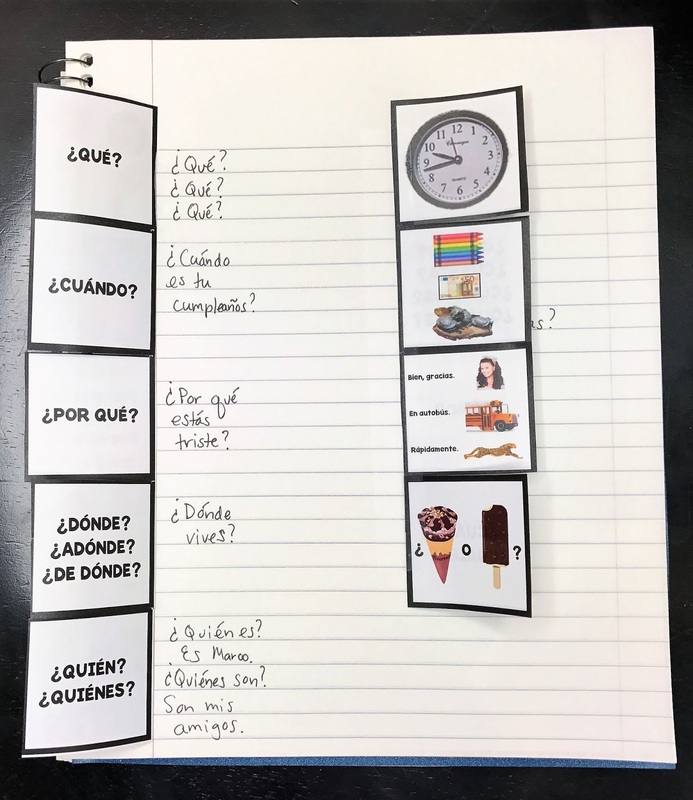 If your students can master these basic concepts of speaking fluently in "yo" and "tú" in multiple tenses and understanding and using question words effectively, they'll have the basis building blocks of communication. By the end of the year, you'll be amazed at how well your students speak! P.S. 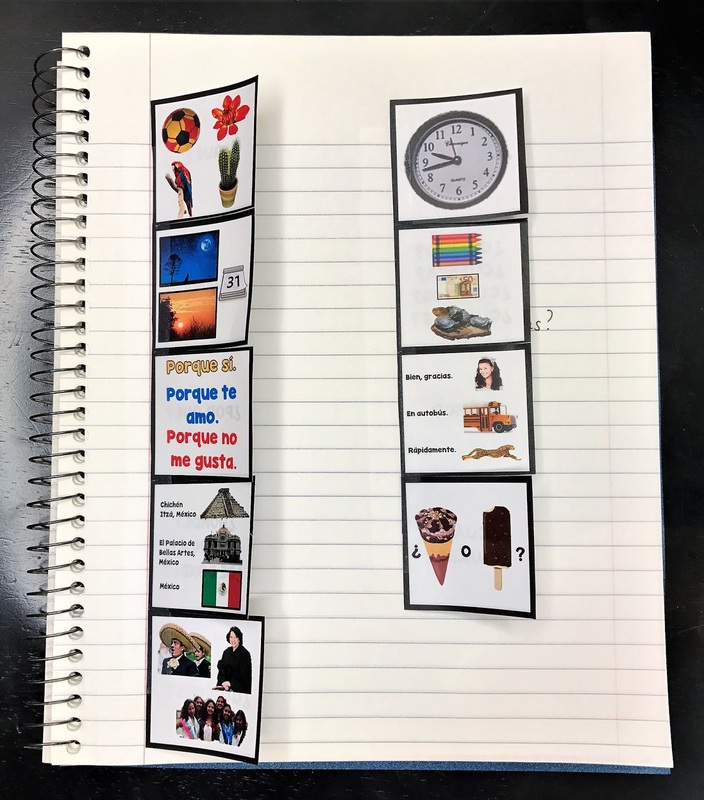 Be sure to check out our other Back to Spanish Class posts to get you excited and ready to go for the first few weeks of school! I love this. I was talking with my colleague about this the other day. I think you are so right... focusing on "yo" and "tú" will help students achieve proficiency in conversation much sooner.